So today I started on the Isagenix 9 Day Cleanse program. My goal for this program is to lose as much weight as possible by following the directions that come with the program. I also have a coach for this program that will be checking up on me and probably this blog too, to see if I’ve been straying from the path. The shake I had this morning and this evening was absolutely horrid. It tasted like a vanilla smoothy that got left out for too long. Tomorrow, I’m going to try to take 6 ounces of water and maybe a couple ice cubes in the blender to make it taste better. I normally have coffee every morning. This morning I had no coffee, but did end up having a small light roast from Starbucks on my way back from downtown. I also grabbed a bottled water so I could dilute it along the way. By the afternoon, I had a big headache, probably from hunger and caffeine withdrawal. This will be my last coffee. I’m not sure if this was cheating or not, but I didn’t see any documentation in the manual in regards to snacks during the initial two day pre-cleanse. 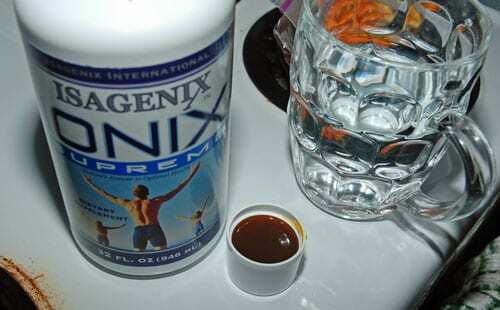 I got so hungry, that I took two of the Isagenix Tablets sometime before dinner. These “Snacks” as they called them are big yellow, chalky, tablets that look like horse tablets. They probably taste the same. Lots of water went down with these. Kelly made me have 6 almonds before bed because it looked like I was going to keel over. I really hope that was OK. Unfortunately, nothing in the documentation to back that one up. Maybe my coach has an answer. Speaking of water, if Frosty the Snowman asked me to paint a tattoo on him, well, I couldn’t help. I’ve been peeing nonstop. Carl said that it’ll all be water weight that I’m going to be losing. I don’t know HOW I could only be losing water weight when I’ve been drinking more than half my weight in ounces. In combination with the caffeine withdrawal headaches, I feel like I’m on a boat! I feel like I’m floating on water. I guess we’ll have to see what happens. For my exercise this evening, I did circuit training consisting of push ups, sit ups, stairs, calf raises, lunges, and anything else I could think of. Did one minute of each activity for the whole 20 minute minimum duration, with stairs in betwen each activity. I’ll take that up to 30 minutes, or just go for a run moving forward. When I was boiling eggs this evening, I somehow forgot that there was water in the pot, and tipped it too far. I was trying to figure out why my feet were getting wet. Good thing the water was only warm. I hope these side effects aren’t permanent. I can’t afford to become stupid. In order to get the most from this 9 day cleanse, I also grabbed the recommended Ionix Supreme (pictured above) and the Isaflush Intestinal Tract Cleanser. Both of these were taken this evening. The Ionix Supreme is this vile liquid that smells as bad as it looks, and tastes even worse. I shot it down, and chased it immediately with a huge glass of water. I still taste it. Then after that, I took down the Isaflush Pill. I’m not sure if anything will be flushing. I haven’t really eaten anything! So that ends my recap of Day 1 of my Pre-Cleanse, and Day 1 of my 11 Day Journey. Stay tuned for tomorrows instalments. Goodnight! Day 2 – Isagenix Pre-Cleanse – Good Grumpy Morning!